"Selected as a benchmark for the Beer Judge Certification Program used in all American based beer judgings. 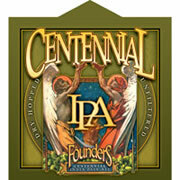 Centennial IPA has quickly become the IPA of choice. Pour yourself a pint of this complex flavorful ale and bask in the frothy head’s floral bouquet. Relish the immense citrus accents, achieved by the abundance of dry hopping. This ale’s sweet, malty undertones balance the hop character with a finish that never turns too bitter." -- Founders Brewing Co. Pours a dark yellow color, settling a light amber color with a large, frothy off-white head with superb staying power. Good lacing. Wonderfully heavy citrus hops hit the nose long before it reaches the rim of the glass, and there is just a general indistinguishable sweetness. Initial taste is sweet, giving a malty taste, and then rapidly turns to a moderate to harsh bitter with lively carbonation. Light to medium on the mouth, it has a dry texture. Wonderfully balanced beer despite the heavy bitter finish, due to the malty beginning and long duration with a smooth finish.